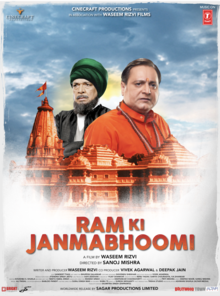 Sagar Productions has bagged the worldwide theatrical distribution rights for the film ‘Ram Ki Janmabhoomi’. The film potrays vividly fictional events since 1990 of the disputed Ram Janmabhoomi – Bahri Masjid site in Ayodhya and is shot majorly at important places of Ayodhya itself. The film is ready for all India theatrical release on March 29, 2019.